ThermoPro: Cook Like A Pro Every Time! The ThermoPro TP-01A food thermometer is an easy and effective way to get the most accurate temperature in a matter of seconds. With a simplistic yet practical design which features a Large LCD display and 5.35" super long food grade stainless steel probe with Step-down Tip to ensure an ultra-fast 4-7 seconds response time and accurate reading. The super long probe can also keep your hands away from the heat when cooking at the grill or in the oven. It’s the best way to know whether your grilled food is cooked to a safe internal temperature, as well as to your preferred doneness. You can easily switch between Celsius or Fahrenheit. By using this grill thermometer, you can ensure the perfect temp every time you're grilling or cooking and make your meal taste like they were prepared by a professional.BBQ Thermometer Features:- Unique Fast Reading system achieves an accurate temperature reading within 4 - 7 seconds- 5.35" super long food grade stainless steel probe with Step-down Tip keep your hands away from the heat when cooking at the grill or in the oven- Ultra-clear screen LCD display with blue backlight help you to see the reading more clearly - Temperature Hold button to lock the current reading for 15s- Celsius/Fahrenheit selector - Battery power saving designCooking Thermometer Specifications:- Probe Length: 5.35" food grade stainless steel probe- Temperature Range: -58°F to 572°F (-50°C to 300°C)- Temperature Accuracy: ±0.9°F (±0.5°C) from 32 to 212°F (0 to 100°C) - Uses: BBQ, Oven, Smoker, Roast, Beef Steak, Pork Chop, Gravy, Soup, Turkey, Candy, Meat, Food, Liquid, Milk, Coffee, Juice, bath water for baby carePackage Contents: 1 x Digital Thermometer1 x Manual2 x AG13 (also named LR44) batteryCAUTION：Do NOT leave in an oven. 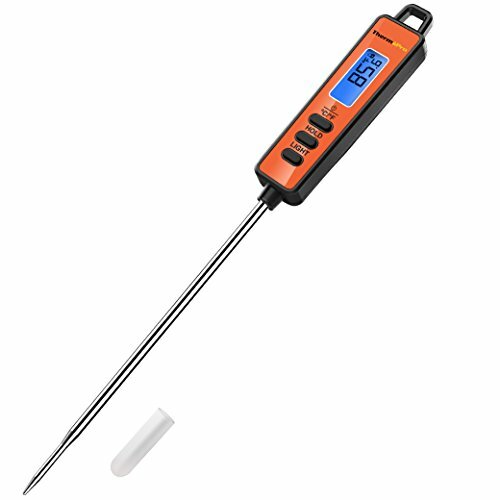 【SUPER LONG PROBE】Grilling thermometer has 5.35" food grade stainless steel probe; No more worrying about getting too close to the hot food or surface, avoid burnt hands! Warranty: 【1 YEAR WARRANTY! REGISTER your product after purchase and RECEIVE EXTENDED 3 YEARS Warranty】ThermoPro US Based Customer Service (Phone & Email) 5 Days a Week, you can reach us at 877-515-7797. Should any repairs or service under this warranty be required, contact Customer Service by phone or email for instructions on how to pack and ship the product back to ThermoPro.